The Town of Clover, South Carolina, nowadays has no flag. However, in the mid 1980s the local Chamber of Commerce or maybe even the Town adopted a flag. Unfortunately, not one flag is preserved, nor any photo of it. Luckily, the flag is depicted on the town mural, so we now know how it looked like. The flag had two horizontal stripes of light blue over white, and a circular emblem near the hoist, mostly over blue and partially over white stripe. 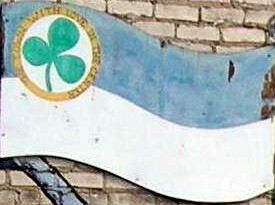 The emblem consists of green clover on a white background. In the outer golden circle inscription "THE TOWN WITH LOVE IN THE CENTER". Information and picture of the mural thanks to Allison Harvey from the Town Administration. "Clover is a town in York County, South Carolina, United States and is also a suburb of Gastonia. The population of the town was 4,916 in the town limits at the 2008 census." - from Wikipedia: en.wikipedia.org/wiki/Clover,_South_Carolina.